Grilling salmon and other foods has never been this easy. 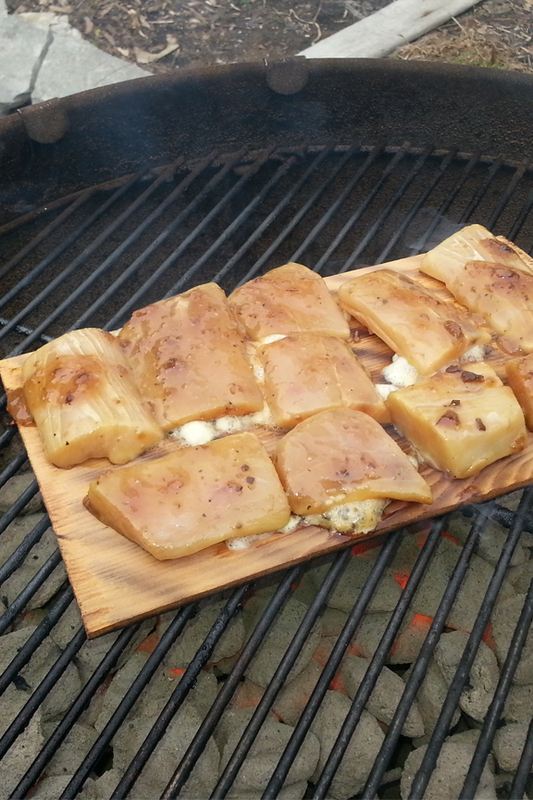 Long established as an ideal way to infuse smoky flavor, and cook to the perfect temperature, cedar planks are notoriously time consuming, and often reserved for special occasions only. This alternative to raw wood comes sealed in a high tech package with the water already added. The double walled bag has a vapor barrier to lock in moisture, so it eliminates prep work, and allows you to get your salmon on the grill in a matter of seconds. 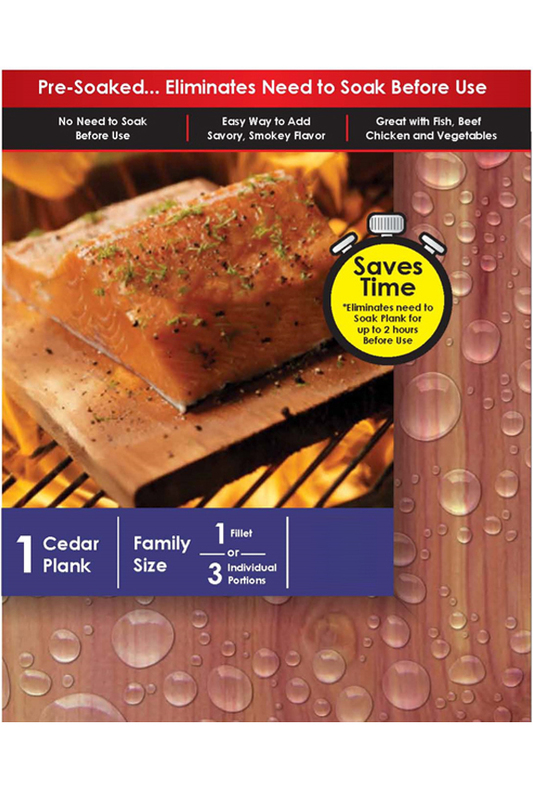 It's a large, family size cooking plank made from top quality cedar, and then soaked to perfection. 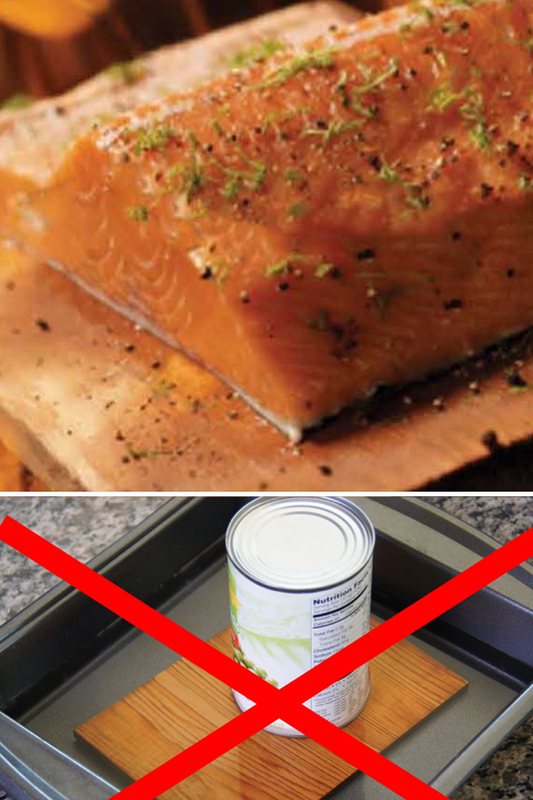 Instead of submerging plain old wood in water, and then waiting for hours, you can tear open the package, and stick it straight onto the grill. It comes with an exact amount of moisture already absorbed into the material, so guess work, waiting, and messy cleanup are eliminated. 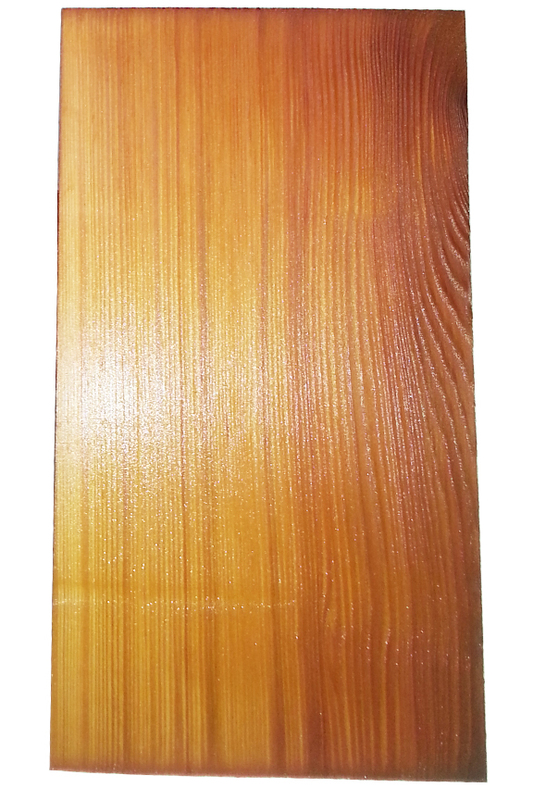 With extra large sizing, this family size plank is big enough to hold a large fillet, or three individual portions. Easy. It could not be more simple. Forget about the extra dishes and multiple steps that are typically required. All of the annoying stuff has already been done for you, so break open the package and take it straight to the grill. Large. This large capacity, family size plank can accommodate several pieces of food at once. It's not so big that it won't fit in your BBQ, but it does provide ample surface for a variety of cooking tasks. Quality. Superior wood results in improved flavor. Each piece is specially selected, and sourced from a sustainable forest. Moist. The key to it's functionality and convenience. Other dry boards force you to do all of the work, but this one has the perfect amount of water, evenly soaked in. Reusable. Manually moisten to use more than once, or use for other stuff after the cooking is complete. It makes the perfect kindling for your fireplace, or fuel for your stove. It also works well as compost or mulch out in your yard. There's nothing better to enhance flavor, eliminate sticking, preserve juices, and ensure that your fish is grilled to perfection. Natives from the Pacific Northwest have employed this cooking technique for generations because the essential oils in the wood infuse a unique flavor while keeping foods moist and delicious. Traditional techniques require you to soak wood for up to two hours in order to prepare it for use. This product allows you to cut out the wait time, but still enjoy the authentic flavor. Use one when broiling or grilling to improve results, and ease the process when working with salmon, scallops, swordfish, sea bass, whitefish, chicken, steaks, burgers, vegetables, or almost anything else. No matter what you cook, the finished product will always be extra juicy and bursting with smoky goodness. If you're looking to simplify the grilling process without compromising quality, this is the perfect item. It offers a fool-proof way to cook seafood and other stuff while preserving flavor and juiciness. The following instructions will detail the process for grilling a piece of salmon, but other meats and vegetables can be cooked with slight modification to the same easy process. Use the steps below to guarantee great results, and eliminate frustration. It can be used indoors or out, and on any cooking surface, but most people use them outside on a gas or charcoal barbecue. To prepare, heat your grill to about 350 degrees, or select and maintain a medium heat setting. Once the fire is ready, and the grate is hot, open the package and place the plank onto the grill. Let it sit for one minute, then flip it over and let it sit for another minute. When you lightly cook each side of the wood, it will make the smokey flavor more intense, and also prevent warping. Add seasoning to your salmon, and then lay it, skin side down, on the plank. Do not layer. Cover the grill and cook for 10-12 minutes. No flipping is required, but exact time will vary. Check after ten minutes, and cook for longer if needed. Thinner cuts will be finished sooner than thicker ones. To ensure it's done, check the temperature. Internal flesh should be 145 degrees when finished. Serve directly on the plank, or transfer to a cutting board or platter. To get rid of the skin prior to serving, use a thin spatula to gently separate it from the rest of the fish. To maximize flavor and maintain temperature, keep the lid closed as much as possible. For best results, an indirect heating method is best. It results in more smoking and less flare ups. A spray bottle with water can help combat flares, and prevent burning. Keep one handy to spritz flames before they become a problem. When finished, get more use out of your plank by burning it in your fireplace, composting in your yard, or turning it into chips for use as fuel. Forget about planning days in advance, and never worry about weighing down a floating board again. This fast and effective alternative to traditional options is ready when you are, and equal in effectiveness when compared to one that you soak yourself. No longer will fancy fish dinners be for special occasions only because you can go from prep to chewing in a matter of minutes instead of hours. With high quality materials and assembly that takes place in the United States, this high quality product is perfect for any home, or professional kitchen. Packaging Specialized to preserve moisture and freshness. Double walled with vapor barrier. Preparation Pre-soaked to perfection. Ready to grill right out of the package. Compatibility Use for fish, beef, chicken, vegetables and more. SFI Certified Yes. Wood sourced from a Sustainable Forestry Provider in North America. No waiting, and no mess to clean up afterward. This top quality plank is perfectly moist right out of the package to eliminate guess work and speed food preparation. Use for grilling or serving, and infuse a smooth and smokey flavor into any food as you cook. Order Yours Today!